This new basic phone brings Internet applications, generous microSD storage space and very good battery life to buyers on a very tight budget. Next to its competitively priced Windows and Android smartphones announced at Mobile World Congress in Barcelona, Nokia also revealed the 220, a very cheap handset advertised as "an Internet-ready mobile phone with social apps" that will soon hit the stores starting at only 29 EUR (roughly $40 USD). The Nokia 220 has a modest 2.4-inch display with 240X320 pixels and 262k colors, a 2 MP camera in the back with video recording capabilities, microSD support for up to 32 GB of storage, FM radio, GPRS and Bluetooth. The phone also features a dust- and splash-proof keypad. According to the official product page, the 1,100 mAh battery can offer up to 29 days of stand-by, 15 hours of talk time and an impressive 51.5 hours of music playback. In terms of software for Internet browsing, the Nokia 220 comes loaded with the Nokia Xpress browser, Facebook and Twitter, while Bing is set as its default search engine. This handset will be available in single and dual SIM variants and bright colors - red, yellow, and blue, next to white and black. Unfortunately, it may not arrive in the United States at all, since Nokia mentioned it will be sold in Asia-Pacific, India, Latin America, Europe, the Middle East and Africa. Barcelona, Spain - Today at Mobile World Congress, Nokia underscored its commitment to connecting the next billion to the Internet by releasing five new affordable handsets, including Nokia X, a family of smartphones that run Android(TM) apps, Microsoft services and signature Nokia experiences. - The Nokia X, Nokia X+ and Nokia XL are priced to capture the fast-growing affordable smartphone market and provide an on-ramp to Lumia and Microsoft services like Skype, OneDrive and outlook.com. 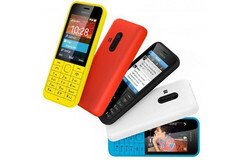 - The Nokia Asha 230 is Nokia's most affordable full-touch Asha device to date, priced at EUR 45. - The Nokia 220 is an Internet-ready mobile phone with social apps, priced at only EUR 29. The Nokia X family features Nokia's renowned handset quality and design, with a fresh, tile-based user interface inspired by our Lumia family. All devices come with Fastlane, a screen which lets people switch between their favorite apps more smoothly. People can access curated, quality-tested apps from Nokia Store, more than a dozen third-party app stores and by sideloading. Out of the box, they can enjoy signature Nokia experiences including free* HERE Maps, with true offline maps and integrated turn-by-turn navigation, and Nokia MixRadio for free* music streaming and downloadable playlists. All devices are also pre-loaded with a variety of third-party apps and games. The first device, the Nokia X, comes with a 4" IPS capacitive display and 3MP camera. The Nokia X+ is optimised for multimedia enthusiasts, who can enjoy even more games, music, photos and video thanks to more memory and storage. Both the Nokia X and Nokia X+ will be available in bright green, bright red, cyan, yellow, black and white**. The third family member, the Nokia XL, boasts a 5" display with 2MP front-facing camera - ideal for Skype video calls - and a 5MP rear-facing, autofocus camera with flash. The Nokia XL will be available in bright green, orange, cyan, yellow, black and white. The entire Nokia X family is powered by the Qualcomm® Snapdragon(TM) dual core processor and supports Dual SIM, letting people switch SIM cards to get better tariffs. About Nokia Nokia is a global leader in mobile communications whose products have become an integral part of the lives of people around the world. Every day, more than 1.3 billion people use their Nokia to capture and share experiences, access information, find their way or simply to speak to one another. Nokia's technological and design innovations have made its brand one of the most recognized in the world. For more information, visit http://www.nokia.com/about-nokia.